A shaman ( /ˈʃɑːmən/ SHAH-men, /ˈʃæmən/ or /ˈʃeɪmən/) is someone who is regarded as having access to, and influence in, the world of benevolent and malevolent spirits, who typically enters into a trance state during a ritual, and practices divination and healing. The word "shaman" probably originates from the Tungusic Evenki language of North Asia. According to ethnolinguist Juha Janhunen, "the word is attested in all of the Tungusic idioms" such as Negidal, Lamut, Udehe/ Orochi, Nanai, Ilcha, Orok, Manchu and Ulcha, and "nothing seems to contradict the assumption that the meaning 'shaman' also derives from Proto-Tungusic" and may have roots that extend back in time at least two millennia. The term was introduced to the west after Russian forces conquered the shamanistic Khanate of Kazan in 1552. Rastas refer to their beliefs, which are based on a specific interpretation of the Bible, as "Rastalogy". Central is a monotheistic belief in a single God—referred to as Jah—who partially resides within each individual. Haile Selassie, the Emperor of Ethiopia between 1930 and 1974, is given central importance. Many Rastas regard him as an incarnation of Jah on Earth and as the Second Coming of Jesus Christ, another figure whom practitioners revere. Other Rastas regard Haile Selassie not as Jah incarnate but as a human prophet who fully recognized the inner divinity in every individual. Rastafari is Afrocentric and focuses its attention on the African diaspora, which it believes is oppressed within Western society, or "Babylon". Many Rastas call for the resettlement of the African diaspora in either Ethiopia or Africa more widely, referring to this continent as the Promised Land of "Zion". Rastas refer to their practices as " livity". Communal meetings are known as "groundations", and are typified by music, chanting, discussions, and the smoking of cannabis, the latter being regarded as a sacrament with beneficial properties. Rastas place emphasis on what they regard as living "naturally", adhering to ital dietary requirements, twisting their hair into dreadlocks, and following patriarchal gender roles. Ayyavazhi ( Tamil: அய்யாவழி, Malayalam: അയ്യാവഴി Ayyāvaḻi [əjːaːvəɻi] ( listen), "Path of the Master") is a henotheistic belief that originated in South India. It is cited as an independent monistic religion by several newspapers, government reports, journals, and academic researchers. In Indian censuses, however, the majority of its followers declare themselves as Hindus. Therefore, Ayyavazhi is also considered a Hindu denomination. Officially (legally), it exists within Hinduism as a Hindu denomination. A mosque ( /mɒsk/; from Arabic: مَـسْـجِـد‎, translit. masjid, lit. place of ritual prostration) is a place of worship for Muslims. Any act of worship that follows the Islamic rules of prayer can be said to create a mosque, whether or not it takes place in a special building. Informal and open-air places of worship are called musalla, while mosques used for communal prayer on Fridays are known as jāmiʿ. Mosque buildings typically contain an ornamental niche ( mihrab) set into the wall that indicates the direction of Mecca ( qiblah), ablution facilities and minarets from which calls to prayer are issued. The pulpit ( minbar), from which the Friday sermon ( khutba) is delivered, was in earlier times characteristic of the central city mosque, but has since become common in smaller mosques. Mosques typically have segregated spaces for men and women. This basic pattern of organization has assumed different forms depending on the region, period and denomination. Judaism (originally from Hebrew יהודה, Yehudah, " Judah"; via Latin and Greek) is the ethnic religion of the Jewish people. It is an ancient, monotheistic, Abrahamic religion with the Torah as its foundational text. 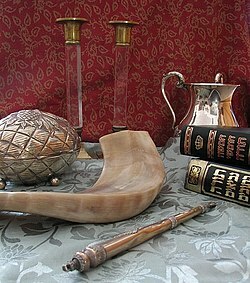 It encompasses the religion, philosophy, and culture of the Jewish people. Judaism is considered by religious Jews to be the expression of the covenant that God established with the Children of Israel. Judaism encompasses a wide body of texts, practices, theological positions, and forms of organization. The Torah is part of the larger text known as the Tanakh or the Hebrew Bible, and supplemental oral tradition represented by later texts such as the Midrash and the Talmud. With between 14.5 and 17.4 million adherents worldwide, Judaism is the tenth largest religion in the world. Within Judaism there are a variety of movements, most of which emerged from Rabbinic Judaism, which holds that God revealed his laws and commandments to Moses on Mount Sinai in the form of both the Written and Oral Torah. Historically, this assertion was challenged by various groups such as the Sadducees and Hellenistic Judaism during the Second Temple period; the Karaites and Sabbateans during the early and later medieval period; and among segments of the modern non-Orthodox denominations. Modern branches of Judaism such as Humanistic Judaism may be nontheistic. Today, the largest Jewish religious movements are Orthodox Judaism ( Haredi Judaism and Modern Orthodox Judaism), Conservative Judaism, and Reform Judaism. Major sources of difference between these groups are their approaches to Jewish law, the authority of the Rabbinic tradition, and the significance of the State of Israel. Orthodox Judaism maintains that the Torah and Jewish law are divine in origin, eternal and unalterable, and that they should be strictly followed. Conservative and Reform Judaism are more liberal, with Conservative Judaism generally promoting a more traditionalist interpretation of Judaism's requirements than Reform Judaism. A typical Reform position is that Jewish law should be viewed as a set of general guidelines rather than as a set of restrictions and obligations whose observance is required of all Jews. Historically, special courts enforced Jewish law; today, these courts still exist but the practice of Judaism is mostly voluntary. Authority on theological and legal matters is not vested in any one person or organization, but in the sacred texts and the rabbis and scholars who interpret them. Chinese folk religion (Chinese popular religion or traditional Chinese religion) or Han folk religion or Shenism is the religious tradition of the Han Chinese, including veneration of forces of nature and ancestors, exorcism of harmful forces, and a belief in the rational order of nature which can be influenced by human beings and their rulers as well as spirits and gods. Worship is devoted to a multiplicity of gods and immortals (神 shén), who can be deities of phenomena, of human behaviour, or progenitors of lineages. Stories regarding some of these gods are collected into the body of Chinese mythology. By the 11th century ( Song period), these practices had been blended with Buddhist ideas of karma (one's own doing) and rebirth, and Taoist teachings about hierarchies of gods, to form the popular religious system which has lasted in many ways until the present day. Buddhism ( /ˈbʊdɪzəm/, US also /ˈbuːd-/) is the world's fourth-largest religion with over 520 million followers, or over 7% of the global population, known as Buddhists. Buddhism encompasses a variety of traditions, beliefs and spiritual practices largely based on original teachings attributed to the Buddha and resulting interpreted philosophies. Buddhism originated in ancient India as a Sramana tradition sometime between the 6th and 4th centuries BCE, spreading through much of Asia. Two major extant branches of Buddhism are generally recognized by scholars: Theravada ( Pali: "The School of the Elders") and Mahayana ( Sanskrit: "The Great Vehicle"). Sikhism ( /ˈsiːkɪzəm/, /ˈsɪkɪzəm/; Punjabi: ਸਿੱਖੀ), or Sikhi Sikkhī, pronounced [ˈsɪkːʰiː], from Sikh, meaning a "disciple", "seeker," or "learner") is a religion that originated in the Punjab region in the northern part of the Indian subcontinent around the end of the 15th century, and has variously been defined as monotheistic, monistic and panentheistic. It is one of the youngest of the major world religions, and the world's fifth largest organized religion, as well as being the world's ninth-largest overall religion. The fundamental beliefs of Sikhism, articulated in the sacred scripture Guru Granth Sahib, include faith and meditation on the name of the one creator, divine unity and equality of all humankind, engaging in selfless service, striving for justice for the benefit and prosperity of all, and honest conduct and livelihood while living a householder's life. In the early 21st century there were nearly 25 million Sikhs worldwide, the great majority of them living in Punjab, according to the Encyclopaedia Britannica. Taoism ( /ˈdaʊɪzəm/, /ˈtaʊ-/), or Daoism ( /ˈdaʊ-/), is a religious or philosophical tradition of Chinese origin which emphasizes living in harmony with the Tao ( Chinese: 道; pinyin: Dào; literally: 'the Way', also romanized as Dao). The Tao is a fundamental idea in most Chinese philosophical schools; in Taoism, however, it denotes the principle that is the source, pattern and substance of everything that exists. Taoism differs from Confucianism by not emphasizing rigid rituals and social order, but is similar in the sense that it is a teaching about the various disciplines for achieving "perfection" by becoming one with the unplanned rhythms of the universe called "the way" or "dao". Taoist ethics vary depending on the particular school, but in general tend to emphasize wu wei (action without intention), "naturalness", simplicity, spontaneity, and the Three Treasures: 慈 "compassion", 儉 "frugality", and 不敢為天下先 "humility". The roots of Taoism go back at least to the 4th century BCE. Early Taoism drew its cosmological notions from the School of Yinyang (Naturalists), and was deeply influenced by one of the oldest texts of Chinese culture, the I Ching, which expounds a philosophical system about how to keep human behavior in accordance with the alternating cycles of nature. The " Legalist" Shen Buhai (c. 400 – c. 337 BCE) may also have been a major influence, expounding a realpolitik of wu wei. The Tao Te Ching, a compact book containing teachings attributed to Laozi ( Chinese: 老子; pinyin: Lǎozǐ; Wade–Giles: Lao³ Tzŭ³), is widely considered the keystone work of the Taoist tradition, together with the later writings of Zhuangzi. Shinto practices were first recorded and codified in the written historical records of the Kojiki and Nihon Shoki in the 8th century. Still, these earliest Japanese writings do not refer to a unified religion, but rather to a collection of native beliefs and mythology. Shinto today is the religion of public shrines devoted to the worship of a multitude of " spirits", " essences" or " gods" ( kami), suited to various purposes such as war memorials and harvest festivals, and applies as well to various sectarian organizations. Practitioners express their diverse beliefs through a standard language and practice, adopting a similar style in dress and ritual, dating from around the time of the Nara and Heian periods (8th–12th centuries). Jainism ( /ˈdʒeɪnɪzəm/), traditionally known as Jain Dharma, is an ancient, non-theistic, Indian religion. Followers of Jainism are called "Jains", a word derived from the Sanskrit word jina (victor) and connoting the path of victory in crossing over life's stream of rebirths through an ethical and spiritual life. Jains consider their religion to be eternal (sanatan), and trace their history through a succession of 24 victorious saviours and teachers known as tirthankaras, with the first in current time cycle being Rishabhanatha, who according to Jain tradition lived millions of years ago, twenty-third being Parshvanatha in 8th century BC and twenty-fourth being the Mahāvīra around 500 BCE. Jains believe that Jainism is an eternal dharma with the tirthankaras guiding every cycle of the Jain cosmology. 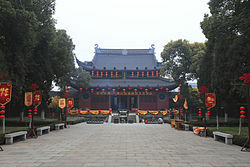 A Confucian revival began during the Tang dynasty (618–907). In the late Tang, Confucianism developed in response to Buddhism and Taoism and was reformulated as Neo-Confucianism. This reinvigorated form was adopted as the basis of the imperial exams and the core philosophy of the scholar official class in the Song dynasty (960–1297). The abolition of the examination system in 1905 marked the end of official Confucianism. The intellectuals of the New Culture Movement of the early twentieth century blamed Confucianism for China's weaknesses. They searched for new doctrines to replace Confucian teachings; some of these new ideologies include the " Three Principles of the People" with the establishment of the Republic of China, and then Maoism under the People's Republic of China. In the late twentieth century Confucian work ethic has been credited with the rise of the East Asian economy. Dharma ( /ˈdɑːrmə/; Sanskrit: धर्म, translit. dharma, pronounced [dʱɐɽmɐ] ( listen); Pali: धम्म, translit. dhamma, translit. dhamma) is a key concept with multiple meanings in Indian religions like Hinduism, Buddhism, Jainism, Sikhism and others. There is no single-word translation for dharma in Western languages. In Hinduism, dharma signifies behaviors that are considered to be in accord with Ṛta, the order that makes life and universe possible, and includes duties, rights, laws, conduct, virtues and "right way of living". In Buddhism, dharma means "cosmic law and order", and is also applied to the teachings of Buddha. In Buddhist philosophy, dhamma/dharma is also the term for " phenomena". Dharma in Jainism refers to the teachings of tirthankara (Jina) and the body of doctrine pertaining to the purification and moral transformation of human beings. For Sikhs, the word dharm means the path of righteousness and proper religious practice. Kabbalah ( Hebrew: קַבָּלָה, literally "reception, tradition" or "correspondence") is an esoteric method, discipline, and school of thought of Judaism. A traditional Kabbalist in Judaism is called a Mequbbāl (מְקוּבָּל). The definition of Kabbalah varies according to the tradition and aims of those following it, from its religious origin as an integral part of Judaism, to its later adaptations in Western esotericism ( Christian Kabbalah and Hermetic Qabalah). Jewish Kabbalah is a set of esoteric teachings meant to explain the relationship between God, the unchanging, eternal, and mysterious Ein Sof (אֵין סוֹף, "The Infinite"), and the mortal and finite universe (God's creation). It forms the foundation of mystical religious interpretations within Judaism. Islam ( /ˈɪslɑːm/) is an Abrahamic monotheistic religion teaching that there is only one God (Arabic: Allah), and that Muhammad is the messenger of God. It is the world's second-largest religion with over 1.8 billion followers or 24% of the world's population, most commonly known as Muslims. Muslims make up a majority of the population in 50 countries. Islam teaches that God is merciful, all-powerful, and unique, and has guided humankind through prophets, revealed scriptures and natural signs. The primary scriptures of Islam are the Quran, viewed by Muslims as the verbatim word of God, and the teachings and normative examples (called the sunnah, composed of accounts called hadith) of Muhammad ( c. 570 – 8 June 632 CE). Muslims believe that Islam is the complete and universal version of a primordial faith that was revealed many times before through prophets including Adam, Abraham, Moses and Jesus. Muslims consider the Quran in its original Arabic to be the unaltered and final revelation of God. Like other Abrahamic religions, Islam also teaches a final judgment with the righteous rewarded paradise and unrighteous punished in hell. Religious concepts and practices include the Five Pillars of Islam, which are obligatory acts of worship, and following Islamic law ( sharia), which touches on virtually every aspect of life and society, from banking and welfare to women and the environment. The cities of Mecca, Medina and Jerusalem are home to the three holiest sites in Islam. Bharatanatyam is a classical dance form originating from Tamil Nadu, a state in Southern India. This popular Tamil dance form is a gentrified version of Cathir, the art of temple dancers. Mírzá Husayn-`Alí ( Persian: میرزا حسینعلی‎) (b: 1817 - d: 1892), who later took the title of Bahá'u'lláh ( Arabic: بهاءالله‎ "Glory of God") was the founder-prophet of the Bahá'í Faith. 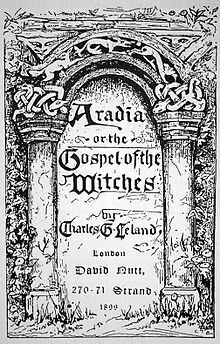 He claimed to fulfill the Bábí prophecy of " He whom God shall make manifest", but in a broader sense he also claimed to be the "supreme Manifestation of God" referring to the fulfillment of the eschatological expectations of a prophetic cycle beginning with Adam, and including Abrahamic religions, as well as Zoroastrianism, the great Dharmic religions, and others. Bahá'ís see Bahá'u'lláh as the initiator of a new religion, as Jesus or Muhammad — but also the initiator of a new cycle, like that attributed to Adam. During his lifetime, Bahá'u'lláh left a large volume of writings. The Kitáb-i-Aqdas, and the Book of Certitude are recognized as primary Bahá'í theological works, and the Hidden Words and the Seven Valleys as primary mystical treatises. 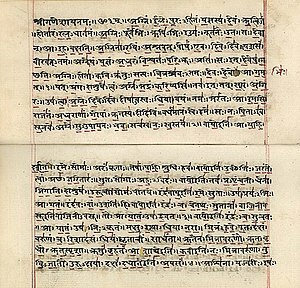 Rigveda ( padapatha) manuscript in Devanagari, early 19th century. After a scribal benediction ( śrīgaṇéśāyanamaḥ Au3m), the first line has the first pada, RV 1.1.1a (agniṃ iḷe puraḥ-hitaṃ yajñasya devaṃ ṛtvijaṃ). The pitch-accent is marked by underscores and vertical overscores in red. The Rigveda ( Sanskrit: ऋग्वेद ṛgveda, from ṛc "praise" and veda "knowledge") is an ancient Indian collection of Vedic Sanskrit hymns along with associated commentaries on liturgy, ritual and mystical exegesis. It is one of the four sacred canonical texts ( śruti) of Hinduism known as the Vedas. The Tao Te Ching ( [tâu tɤ̌ tɕíŋ] ( listen)), also known by its pinyin romanization Dao De Jing, is a Chinese classic text traditionally credited to the 6th-century BC sage Laozi. The text's authorship, date of composition and date of compilation are debated. The oldest excavated portion dates back to the late 4th century BC, but modern scholarship dates other parts of the text as having been written—or at least compiled—later than the earliest portions of the Zhuangzi. Through the reception of the Book, Crowley proclaimed the arrival of a new stage in the spiritual evolution of humanity, to be known as the " Æon of Horus". The primary precept of this new aeon is the charge to " Do what thou wilt". According to Smith's account and the book's narrative, the Book of Mormon was originally written in otherwise unknown characters referred to as " reformed Egyptian" engraved on golden plates. Smith said that the last prophet to contribute to the book, a man named Moroni, buried it in the Hill Cumorah in present-day Manchester, New York before his death, and then returned to Earth in 1827 as an angel, revealing the location of the plates to Smith, and instructing him to translate the plates into English for use in the restoration of Christ's true church in the latter days. Critics claim that it was authored by Smith, drawing on material and ideas from contemporary 19th-century works rather than translating an ancient record. Akilathirattu Ammanai ( Tamil: அகிலத்திரட்டு அம்மானை; akilam ("world"), thirattu ("collection"), ammanai ("ballad")), also called Thiru Edu ("venerable book"), is the main religious text of the Tamil belief system Ayyavazhi. The title is often abbreviated to Akilam or Akilathirattu. The Hebrew Bible, also called the Tanakh ( /tɑːˈnɑːx/; תַּנַ״ךְ, pronounced [taˈnaχ] or [təˈnax]; also Tenakh, Tenak, Tanach) or Mikra, is the canonical collection of Jewish texts, which is also the textual source for the Christian Old Testament. These texts are composed mainly in Biblical Hebrew, with some passages in Biblical Aramaic (in the books of Daniel, Ezra and a few others). The form of this text that is authoritative for Rabbinic Judaism is known as the Masoretic Text (MT), and is divided into 24 books, while the Protestant Bible translations divide the same material into 39 books. The Bhagavad Gita ( /ˌbʌɡəvəd ˈɡiːtɑː, -tə/; Sanskrit: भगवद्गीता, IAST: bhagavad-gītā, lit. "The Song of God"), often referred to as the Gita, is a 700- verse Sanskrit scripture that is part of the Hindu epic Mahabharata (chapters 23–40 of Bhishma Parva). The Quran ( /kɔːrˈɑːn/ kor-AHN; Arabic: القرآن‎, translit. al-Qurʾān Arabic pronunciation: [alqur'ʔaːn], literally meaning "the recitation"; also romanized Qur'an or Koran) is the central religious text of Islam, which Muslims believe to be a revelation from God ( Allah). It is widely regarded as the finest work in classical Arabic literature. The Quran is divided into chapters (Arabic: سورة sūrah, plural سور suwar), which are subdivided into verses (Arabic: آية āyah, plural آيات āyāt). Muslims believe that the Quran was orally revealed by God to the final Prophet, Muhammad, through the archangel Gabriel ( Jibril), incrementally over a period of some 23 years, beginning on 22 December 609 CE, when Muhammad was 40, and concluding in 632, the year of his death. Muslims regard the Quran as Muhammad's most important miracle, a proof of his prophethood, and the culmination of a series of divine messages starting with those revealed to Adam and ending with Muhammad. 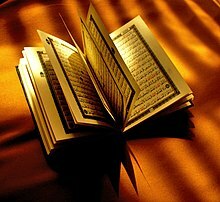 The word "Quran" occurs some 70 times in the Quran's text, and other names and words are also said to refer to the Quran. During the First Buddhist Council, Ananda recited the Sutta Pitaka, Upali the Vinaya Pitaka thirty years after the parinibbana of Gautama Buddha in Rajgir. The Arhats present accepted the recitations and henceforth the teachings were preserved orally by the Sangha. The Tipitaka that was transmitted to Sri Lanka during the reign of King Asoka were initially preserved orally and were later written down during the Fourth Buddhist Council in 29 BCE, approximately 454 years after the death of Gautama Buddha. Textual fragment of similar teachings have been found in the agama of other major Buddhist schools in India. They were however written down in various Prakrits other than Pali as well as Sanskrit. Some of those were later translated into Chinese (earliest dating to the late 4th century CE). The surviving Sri Lankan version is the most complete, but one that was extensively redacted about 1,000 years after Buddha's death, in the 5th or 6th century CE. The earliest textual fragments of canonical Pali were found in the Pyu city-states in Burma dating only to the mid 5th to mid 6th century CE. Sri Guru Granth Sahib ( Punjabi: ਗੁਰੂ ਗ੍ਰੰਥ ਸਾਹਿਬ/Punjabi pronunciation: [ɡʊɾu ɡɾəntʰ sɑhɪb]) is the Sikh scriptures. It was compiled by the ten gurus of Sikhism and is itself regarded by Sikhs as the final, sovereign, and eternal living guru. Adi Granth, the first rendition, was compiled by the fifth Sikh guru, Guru Arjan. The tenth guru, Guru Gobind Singh, added one shloka, dohra mahala 9 ang, 1429 and all 115 hymns of his father, Guru Tegh Bahadur. This second rendition came to be known as Sri Guru Granth Sahib. After Guru Gobind Singh's death in 1708, Baba Deep Singh and Bhai Mani Singh prepared many copies of the Sri Guru Granth Sahib for distribution. The Kitáb-i-Aqdas or Aqdas is the central book of the Bahá'í Faith written by Bahá'u'lláh, the founder of the religion, in 1873. The work was written in Arabic under the Arabic title al-Kitābu l-Aqdas ( Arabic: الكتاب الأقدس‎ / al-Kitāb al-ʾaqdās), but it is commonly referred to by its Persian title, Kitáb-i-Aqdas ( Persian: كتاب اقدس‎ / Ketâb Âqdas), which was given to the work by Bahá'u'lláh himself. It is sometimes also referred to as "the Most Holy Book", "the Book of Laws" or the Book of Aqdas. The word Aqdas has a significance in many languages as the superlative form of a word with its primary letters Q-D-Š. The Ten Commandments ( Hebrew: עֲשֶׂרֶת הַדִּבְּרוֹת, Aseret ha'Dibrot), also known as the Decalogue, are a set of biblical principles relating to ethics and worship, which play a fundamental role in Judaism and Christianity. The commandments include instructions to worship only God, to honour one's parents, and to keep the sabbath day holy, as well as prohibitions against idolatry, blasphemy, murder, adultery, theft, dishonesty, and coveting. Different religious groups follow different traditions for interpreting and numbering them. 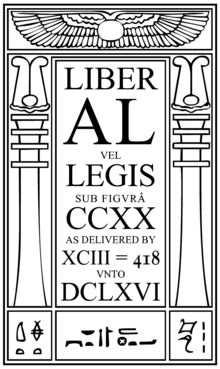 The Septuagint (from the Latin: septuāgintā literally "seventy", often abbreviated as LXX and sometimes called the Greek Old Testament) is the earliest extant Greek translation of the Hebrew scriptures from the original Hebrew. It is estimated that the first five books of the Old Testament, known as the Torah or Pentateuch, were translated in the mid-3rd century BCE and the remaining texts were translated in the 2nd century BCE. 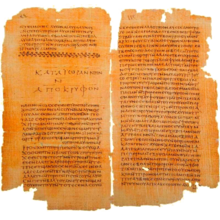 Considered the primary Greek translation of the Old Testament, it is quoted a number of times in the New Testament,[ better source needed]particularly in the Pauline epistles,[ better source needed]by the Apostolic Fathers, and later by the Greek Church Fathers. The I Ching or Yi Jing ( Chinese: 易經; pinyin: Yìjīng; Mandarin pronunciation: [î tɕíŋ] ( listen)), also known as Classic of Changes or Book of Changes, is an ancient Chinese divination text and the oldest of the Chinese classics. Possessing a history of more than two and a half millennia of commentary and interpretation, the I Ching is an influential text read throughout the world, providing inspiration to the worlds of religion, psychoanalysis, literature, and art. Originally a divination manual in the Western Zhou period (1000–750 BC), over the course of the Warring States period and early imperial period (500–200 BC) it was transformed into a cosmological text with a series of philosophical commentaries known as the " Ten Wings". After becoming part of the Five Classics in the 2nd century BC, the I Ching was the subject of scholarly commentary and the basis for divination practice for centuries across the Far East, and eventually took on an influential role in Western understanding of Eastern thought. Torah ( /ˈtɔːrə, ˈtoʊrə/; Hebrew: תּוֹרָה, "Instruction", "Teaching" or "Law") has a range of meanings. It can most specifically mean the first five books (Pentateuch) of the 24 books of the Tanakh, and it is usually printed with the rabbinic commentaries ( perushim). It can mean the continued narrative from the Book of Genesis to the end of the Tanakh ( Malachi), and it can even mean the totality of Jewish teaching, culture and practice, whether derived from biblical texts or later rabbinic writings. 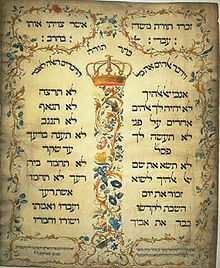 Common to all these meanings, Torah consists of the origin of Jewish peoplehood: their call into being by God, their trials and tribulations, and their covenant with their God, which involves following a way of life embodied in a set of moral and religious obligations and civil laws ( halakha). In rabbinic literature the word Torah denotes both the five books ( Hebrew: תורה שבכתב‎ "Torah that is written") and the Oral Torah (תורה שבעל פה, "Torah that is spoken"). The Oral Torah consists of interpretations and amplifications which according to rabbinic tradition have been handed down from generation to generation and are now embodied in the Talmud and Midrash. 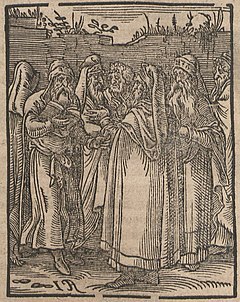 Rabbinic tradition's understanding is that all of the teachings found in the Torah (both written and oral) were given by God through the prophet Moses, some at Mount Sinai and others at the Tabernacle, and all the teachings were written down by Moses, which resulted in the Torah that exists today. According to the Midrash, the Torah was created prior to the creation of the world, and was used as the blueprint for Creation. The majority of Biblical scholars believe that the written books were a product of the Babylonian captivity (c. 6th century BCE), based on earlier written sources and oral traditions, and that it was completed with final revisions during the post-Exilic period (c. 5th century BCE). Ḥadīth ( /ˈhædɪθ/ or /hɑːˈdiːθ/; Arabic: حديث‎ ḥadīth Arabic pronunciation: [ħadiːθ], pl. Aḥādīth, أحاديث, ʼaḥādīth Arabic pronunciation: [ʔaħadiːθ], also "Traditions") in Islam are the record of the words, actions, and silent approval, traditionally attributed to the Islamic prophet Muhammad. Within Islam the authority of hadith as a source for religious law and moral guidance ranks second only to that of the Quran (which Muslims hold to be the word of Allah revealed to his messenger Muhammad). Quranic verses (such as 24:54, 33:21) enjoin Muslims to emulate Muhammad and obey his judgments, providing scriptural authority for hadith. While the number of verses pertaining to law in the Quran is relatively few, hadiths give direction on everything from details of religious obligations (such as Ghusl or Wudu, ablutions for salat prayer), to the correct forms of salutations and the importance of benevolence to slaves. Thus the "great bulk" of the rules of Sharia (Islamic law) are derived from ahadith, rather than the Quran.